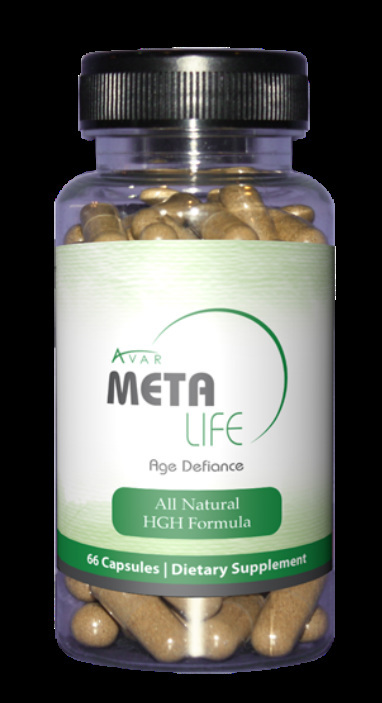 META Life is our HGH formulated product. Known as the ultimate anti‐ager, HGH affects almost every cell in the body—regenerating skin, hair, muscles, bones, heart, lungs, liver and kidneys to their former youthful levels. It is used by the body to speed up metabolism and reduce the size of the abdomen, hips, waist and thighs, while increasing muscle mass. Healthy sleep patterns return providing the deepest level of sleep for optimum well being. DIRECTIONS: Take 3 capsules with 6-8oz of water. For best results take at bedtime 3 hours after evening meal on an empty stomach. Take for 5 days and skip 2 days. Repeat. For optimal effectiveness take as directed 3 consecutive months and repeat. For aging pets give proportional to body weight. META Renew was formulated specifically to support the liver, naturally aid in body detoxifying and contribute to weight release. The liver is often overlooked when considering a cleansing program. When the liver is over‐stressed all other organs start to dysfunction. Directions: As a dietary supplement, take 3 capsules daily with water. As a 30 day cleanse, rotate one month on and one month off. Store in a cool dry place. As the largest internal organ, the liver is responsible for some 500 bodily functions. It processes almost everything we ingest, breathe, or absorb through the skin. It plays an important role in digestion and metabolism, regulating the production, storage, and release of sugar, fats, and cholesterol. The liver produces a variety of important proteins, including enzymes, hormones, blood proteins, clotting factors, and immune factors. Finally, the liver plays a role in detoxification. It filters infectious organisms, alcohol, heavy metals, drugs, and other poisons from the blood, and also processes and eliminates toxic byproducts of normal metabolism. AVAR is proud to introduce to you one of their newest products META pH for an Optimal Alkaline and Mineral Balanced Body! The issue of body acidity and alkalinity is beginning to show some importance in the overall health of the body. Many alternative practitioners of alternative medicine believe that modern lifestyle is pushing many people to a body status of acidity (low pH). Acidosis (overly acidic body) is the primary indicator of a Mineral Deficiency Disease. Scientists have discovered that the body fluids of healthy people are alkaline (high pH) whereas the body fluids of sick people are acidic (low pH). Scientists have found that healthy people have systems that are alkaline. Scientists have also found that over 200 degenerative diseases are linked to Mineral Deficiency - including cancer, diabetes, arthritis, heart disease, gall and kidney stones, and many more. It has been proposed that the intake of alkaline metals (like calcium), may assist in helping to neutralize the body acidity in a positive manner. For instance, many people that have arthritic conditions, have a low pH and their symptoms are made worse by eating acidic foods like tomatoes and oranges. Sango Coral Calcium has the ability to help with the body's balancing of the pH which also proves to be one of its most important health benefits. The Sango Coral Calcium is FULL OF TRACE MINERALS! The most common elements in the Sango Coral Calcium are calcium and magnesium. The trace mineral analysis is impressive and could very well account for the many health benefits that this product seems to bring about. Our industrialized society has been severely depleted of these micronutrient elements and they are essential for the proper functioning of all body cells. Several years ago, Congressional documents Number 23476 said there is not enough minerals in the soil to support health for our bodies. The mineral have to be in the soil first in order to get into our food products and then into our bodies. If we don't use food supplements to keep us healthy, we certainly cannot be healthy. Sango Coral Calcium contains 74 trace minerals, supplying our bodies with the minerals it needs. Coral Calcium minerals are naturally ionized (nature's smallest form, 1000 times smaller than colloidal) allowing for almost total bioavailability. Considering all of the major minerals, Calcium is of utmost importance! Almost twice as much Calcium is needed as any other mineral. In Okinawa, Japan, you will find very little disease or doctors. These people just don't get sick with the diseases we face here. The one thing that makes them different from us is they ingest 1000's of milligrams of calcium daily. It's found naturally in their drinking water. If you don't acknowledge this factor, you cannot be healthy. Good health is no accident. We all must drink lots of good water ever day, get in the sunshine, and get all the minerals needed daily. This requires daily supplements. These are approximately 74 'trace' minerals present in very low parts per millions (ppm's). Take 2 capsules in the evening with water. This product does not contain any major allergen (soy, milk, wheat, egg, shellfish, fish, peanuts, tree nuts). There are no known side effects associated with this product. However, as with any food product, there may be infrequent and unusual highly sensitized reactions associated with this or any other nutritional supplement. If such a reaction occurs, you should consider discontinuing use of this or any product. Pregnant or lactating women should consult a health care professional before taking this product. Keep out of reach of Children. ​Optimal Balance is the Key to Great Health! The body’s blood pH, or acidity content, must be kept within a narrow range - 7.35 to 7.45.
c) provide alkalinity and an environment rich in oxygen. Of all the minerals, calcium is needed nearly as twice as much as any other mineral. Again, alkaline metals, including calcium, help to neutralize acidity within the body. Based on the exponent of 10, a difference of just ‘1’ pH can have a major impact on the amount of oxygen available for numerous body systems. If you haven’t yet discovered this, know that your pH levels are directly related to the oxygen content in the blood. Take this figure for instance - the difference of just 1 pH (remember, blood remains in a range of 7.35 - 7.45) of 7.45 contains nearly 65% more oxygen than a pH value of 7.30. This is important because scientific findings show that adverse health conditions cannot exist in such oxygen-rich environments. The ability for coral calcium to assist the body in balancing its natural pH levels is one of its most important benefits. META pH ​not only ensures that your body’s calcium needs are met and maintained, this unique formula also includes a correct ratio of Magnesium and Vitamin D to regulate many other important bodily functions not related to calcium. AVAR is proud to introduce to you one of their newest products META pH Mineral Drops for an Optimal Alkaline and Mineral Balanced Body! The issue of body acidity and alkalinity is beginning to show some importance in the overall health of the body. Many alternative practitioners of alternative medicine believe that modern lifestyle is pushing many people to a body status of acidity (low pH). Acidosis (overly acidic body) is the primary indicator of a Mineral Deficiency Disease. Scientists have discovered that the body fluids of healthy people are alkaline (high pH) whereas the body fluids of sick people are acidic (low pH). Scientists have found that healthy people have systems that are alkaline. Scientists have also found that over 200 degenerative diseases are linked to Mineral Deficiency - including cancer, diabetes, arthritis, heart disease, gall and kidney stones, and many more. It has been proposed that the intake of alkaline metals (like calcium), may assist in helping to neutralize the body acidity in a positive manner. For instance, many people that have arthritic conditions, have a low pH and their symptoms are made worse by eating acidic foods like tomatoes and oranges. ​AVAR META pH Mineral Drops contains over 70 trace minerals, supplying our bodies with the minerals it needs. Coral Calcium minerals are naturally ionized (nature's smallest form, 1000 times smaller than colloidal) allowing for almost total bioavailability. Considering all of the major minerals, Calcium is of utmost importance! Almost twice as much Calcium is needed as any other mineral. In Okinawa, Japan, you will find very little disease or doctors. These people just don't get sick with the diseases we face here. The one thing that makes them different from us is they ingest 1000's of milligrams of calcium daily. It's found naturally in their drinking water. If you don't acknowledge this factor, you cannot be healthy. Good health is no accident. We all must drink lots of good water ever day, get in the sunshine, and get all the minerals needed daily. This requires daily supplements. These are approximately 74 'trace' minerals present in very low parts per millions (ppm's). META pH Mineral Drops is designed to reduce excess acid in the body by adding alkaline buffer (bicarbonate) to the blood.The foods that we eat give us energy by oxidizing. Afterwards they become acidic wastes. Since our body cannot get rid of all the wastes it produces, they get accumulated somewhere in our body. This accumulation of non-disposed acidic wastes is a root cause of aging. The best way to neutralize and get these wastes out of our body is to drink alkaline water. One 2 oz. bottle of META pH Mineral Drops creates 60-90 fresh alkaline water servings​​​​. Amounts may vary. Make alkaline water easily and inexpensively. Just one dropper full in an 8 or 16 oz. glass or bottle of ordinary drinking water helps reduce acidic waste in the body for better health and longevity. Optimal Balance is the Key to Great Health! META‐Cardio+ is a complete, all natural, non GMO, Vegan compliant Cardio Health supplement for men and women containing L‐Arginine. DIRECTIONS: Mix 1 serving (2 teaspoons) with 4-8 oz of water (to taste). Stir to dissolve. For very cold water, dissolve for one minute. Take 1 serving (2 teaspoons) up to twice per day.